It's been no fun in sunny Florida today. Broken water pipe, a snake and lots of rain. I can't complain we really need the rain but the water pipe and snake...NOT so much. Today's card is one of my favorites I have designed. I love this happy lady with her duster. She is colored with Copics of course and I added a little glitter pens to make her earrings spare. I found the perfect sentiment to go with her attitude. Posted by Karen at 6:30 PM 0 Click here to leave me a comment. I just love this single stamp. The chicks have a lot to say. Party on! I colored the image with my Copics, layered some patterned paper and ribbon and I piled in a few dimensionals. The saying is stamped and punched using the word window by Stampin Up. That's an awesome little punch! Posted by Karen at 11:33 PM 0 Click here to leave me a comment. Have I mentioned how addicted to the Paper Smooches stamps I am? 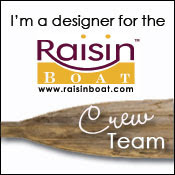 They are so much fun to work with and so versatile. 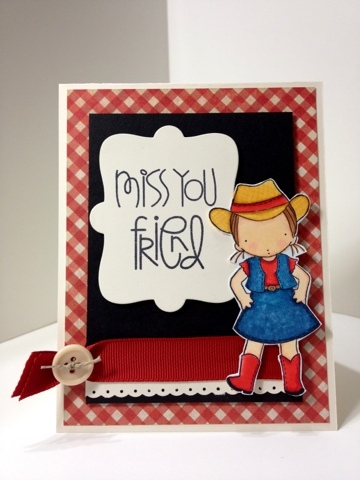 Today's card is made using the Falling For You set. I had to have it because of that cute little monster but I quickly became partial to the apple in the set. I colored the apple with my Copics and embossed the Crumb Cake paper with the large dot embossing folder. I need to start counting the dimensionals I use on each card because I am going through them like crazy. Posted by Karen at 8:54 PM 0 Click here to leave me a comment. Hello everyone. I can't believe we are Inching up on another weekend and it's going to be beautiful. Beach bound!!!! Today's card is as bright as sunny Florida. I love the fun colors. 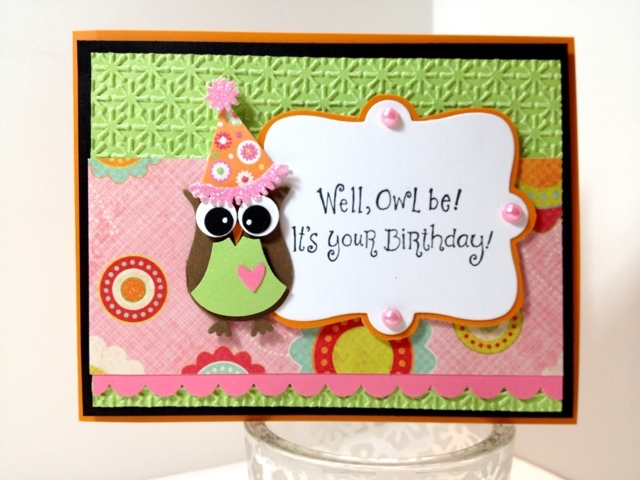 The owl is made from the Stampin Up Owl punch. His hat was premade. I embossed the green using the Stampin Up snow burst embossing folder. It doesn't really look like snow to me but it is a really fun design. I added pink pearls to the sentiment label which is from My Favorite things. I included a close up of the owl so you can see the detail. Posted by Karen at 5:17 AM 0 Click here to leave me a comment. Hello! This is one of my favorite Stampin Up stamps. I just love the mason jar. I colored the image with my Copic Markers and added some silver glitter to the jar to create a glass effect. I also used my lightest blue to make the water in the jar. I just love the simplistic but elegant look. I chose a subtle blue patterned paper and black matting for a pop of wow. Notice my perfect little bow! Classes are coming and when you see just how easy it is to tie you will want to put a now on everything. Make sure you sign up on the right to be notified when I post a new project and a big thanks to all of my new followers! Posted by Karen at 6:02 AM 2 Click here to leave me a comment. Being off of work for four days makes it hard to go back but I am back today and can rest! It's been a nonstop four days with loads of fun. I needed it. Todays card is a simple one! 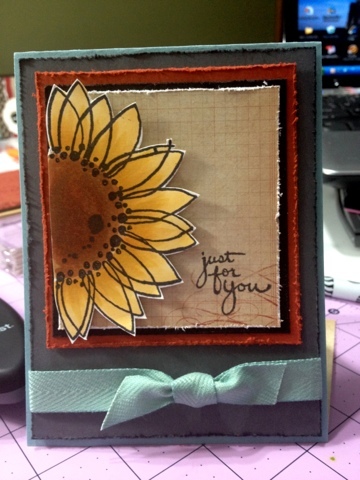 A little patterned paper, punched distressed flower a button and sentiment. This is an awesome sketch to keep handy as it can be adapted to any occasion! I have thirty six creations to share with you. I figure I'd get ahead of the game as its beach weather and I will be relaxing with my toes in the sand as much as I can! Posted by Karen at 8:49 AM 0 Click here to leave me a comment. Well almost! LOL. I received this set as a bonus from the grand re opening of My Favorite Things store in Eustis, Florida. It was great to see all of the dies and stamps hands on but it hiding make it any easier to choose what I bought. Posted by Karen at 5:55 AM 0 Click here to leave me a comment. Friday we shopped from 10:00 till 5:30! What a fun day. It was a beautiful day to be out and about and we covered a lot of territory. 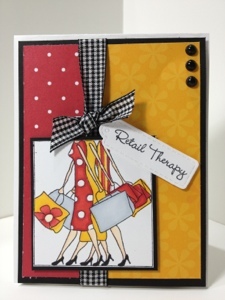 Today's card is made using the my favorite things stamp retail therapy. I love the bright fun colors. I used my Copics to color the image. Layered pattern paper and added a nice bow. Posted by Karen at 7:39 AM 0 Click here to leave me a comment. Sometimes you just want to write a little not to someone to say you are thinking about them. Today's card is just that! A card with no sentiment just a hand written note. People don't sent those much anymore but is brings a lot of joy! I colored the flower with my Copics added the top note die and white ribbon. Posted by Karen at 9:24 AM 0 Click here to leave me a comment. Hello everyone. I'm late posting this morning from a late night last night. In so glad it's Friday. Busy weekend ahead. 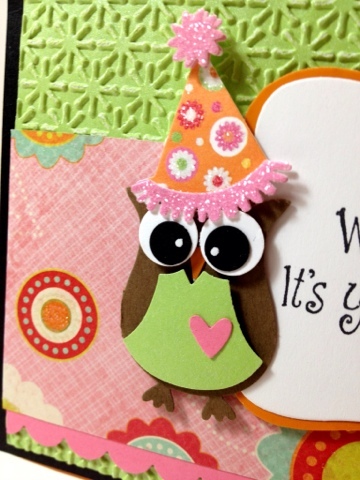 Today's card is the made using the Paper a smooches owl. He is just adorable. I love his two size eyes. I colored him with my copic markets and stamped the wood stamp on brown cardstock to make the tree. There are two layers with a circle cut out of the top layer for him to peek out of. I hope everyone has a great weekend. It's about time to hit the beach in sunny Florida. Posted by Karen at 9:19 AM 0 Click here to leave me a comment. I can't believe Easter is only two weeks away. 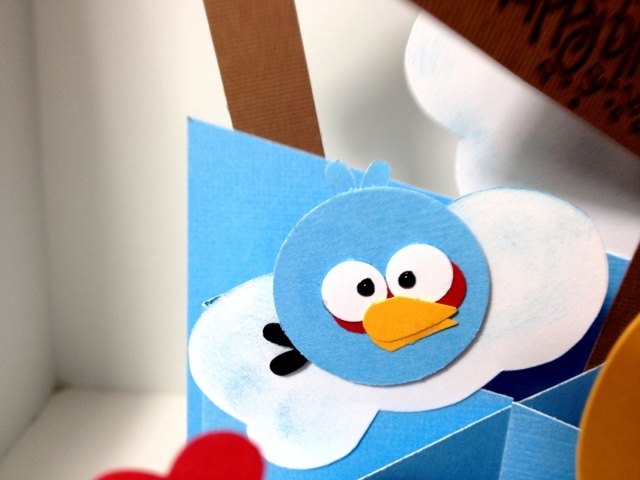 Today I am sharing one of the Easter projects I created. I kept with the pastels but chose the Tiffany blue which goes nicely with the brown. 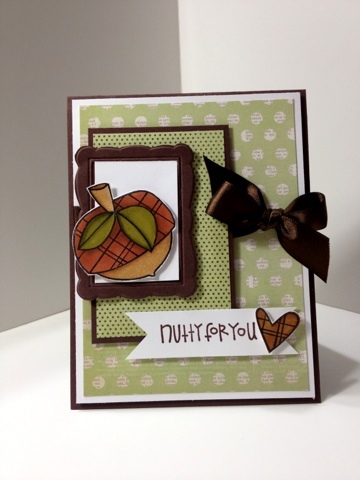 I used a coordinating ribbon with multiple layers on an embossed background. 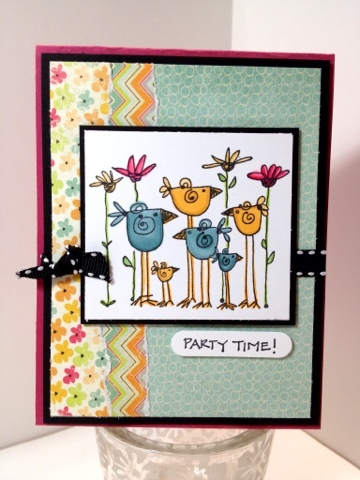 The finishing touch of three little pearls perfectly finishes this adorable card. Posted by Karen at 3:01 AM 0 Click here to leave me a comment. 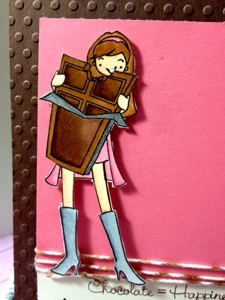 When I was shopping last week I came across a piece of 12 x 12 glittered (pink of course) card stock. The paper was covered in glittered circles with the exception of this section that looke like a large label. 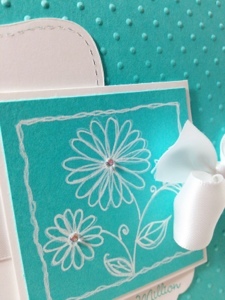 I immediately thought this would be a great place for a scalloped circle on a card. I cut the cardstock down the center and then sectioned off that part of the cardstock to fit the front of a card. 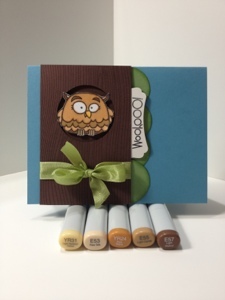 The rest of the cardstock can now be used for a small scrapbook page or patterned paper for more cards. I used my Copic markers to color the flower and used dimensionals to attach. Posted by Karen at 8:00 AM 0 Click here to leave me a comment. Hello Everyone! I'm not sure what category today's card fits into. It could be congratulations, birthday, or just a girlfriend card. I found the diamond paper at a local store and knew it had so much potential for a lot of themes but the chickens came to mind immediately. 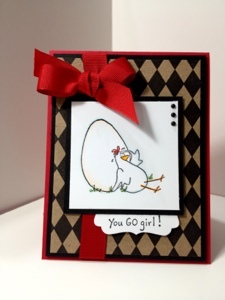 I colored the chicken and eggs with my Copics added the sentiment with a tag punch and had a quick little card! Posted by Karen at 5:47 AM 0 Click here to leave me a comment. Monday Monday! They sure roll around quickly don't they? Today I have a cute little cat card to share with you. 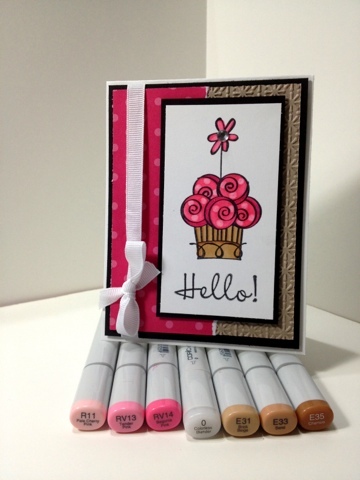 It is made using the Paper Smooches Chubby Chums set. 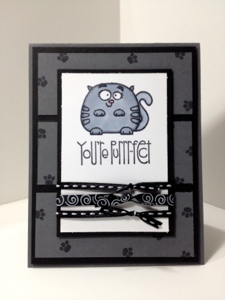 I colored the cat with my Copics and stamped the Basic Gray cardstock with the paw print stamp included with the set. I also used two different scrap ribbons for accent. Posted by Karen at 5:38 AM 1 Click here to leave me a comment. A box arrived in the mail today with birthday presents for me from my sister. This cute little stamp and the embossing folder that I used to create the background for my card were the first two things out of the box! I already had the Tiffany blue scraps on my desk do I paired it with girly pink and made my creation. Posted by Karen at 11:02 PM 1 Click here to leave me a comment. Unfortunately, I worked from memory.. LOL, not so good!! My card turned out quite different so... we thought we'd share a twist today on both our blogs... two similar card and one fabulous free tutorial too! Here's my card!! Supplies you’ll need: tri-fold gift card holder tutorial! 1. Use Big Shot Die Cutting Machine and Square Lattice Textured Impressions Embossing Folder to emboss 1.75” portion of River Rock Card Stock and 4.25” x 4.75” Basic Black Card Stock. 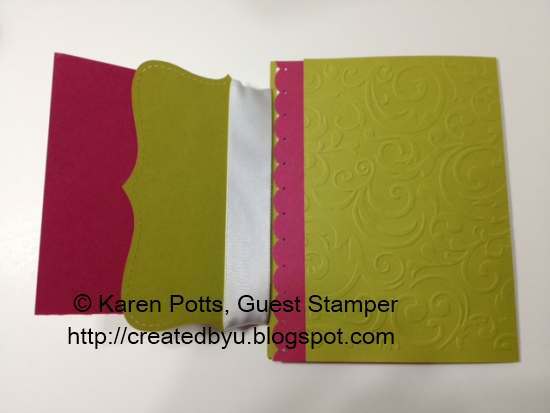 Fold embossed flap toward middle of card and place sticky strip along two short edges, and scored edge. 2. Punch along one 4.25” edge of embossed basic black card stock using the eyelet border punch, remove sticky tape protective layer and attach embossed/punched basic black card stock to inside flap of card. 3. Tie approximately 18” of Basic Black Satin Ribbon into a lovely loopy bow, around opposite river rock card stock flap. LOL… apparently I did it a bit differently when I made the card… the basic black piece isn’t in place yet.. yikes! 4. Ink the En Francais large format background stamp with Basic Black Ink and stamp the pre-cut confetti cream top note die cut. 5. 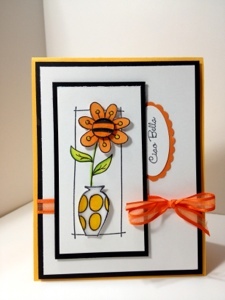 Use River Rock ink and a wedge of stampin’ sponge to distress and sponge edges of top note die cut. 7. Use Big Shot Die Cutting Machine and remaining basic black card stock piece to die cut similarly sized framelits label die. 8. Stamp the crown/flourish/frame image from Elementary Elegance Stamp Set onto larger scrap of Confetti Cream Card Stock and use the next smaller framelits label to die cut the image. NOTE: you will be cutting away some of the image… that’s OK! 9. Sponge all edges using stampin’ sponge and River Rock ink, attach to center of basic black framelits die cut. 10. Stamp Happy Birthday greeting on remaining scrap of Confetti Cream card stock, and punch using the Curly Label punch. After distressing the edges as in steps 8/9, center and attach to die cuts and card front as shown below. 11.Attach a basic Rhinestone Jewel to the top/center of the crown on the Elementary Elegance image… and you’re done! 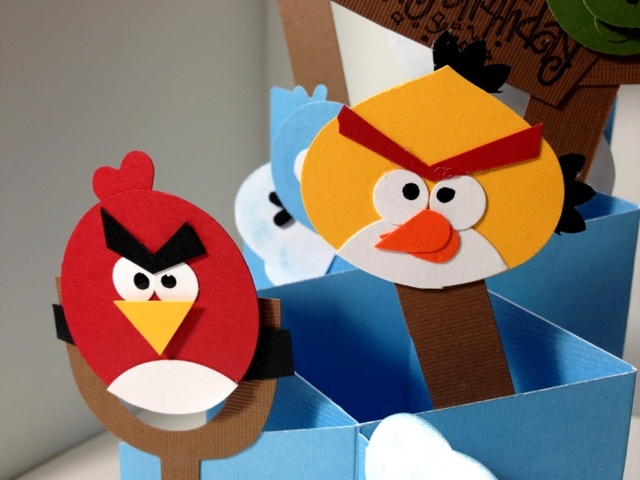 Today’s Tips for Paper Crafters! When tightening your loopy bow, pull the tails in opposing directions to add interest! When embossing pre-scored card stock feed the ‘loose’ end through the die cutting machine first to avoid additional creasing. Use an office clip to squeeze/hold your stampin’ sponge wedge to keep your fingertips nice and clean. Hope you enjoyed today's collaborative project! It's been a blast! Posted by Sharon Field / Inky A*Muse-ment at 4:30 AM 0 Click here to leave me a comment. My daughter is so taken with anything related to that little blue box with the white ribbon. During a recent visit to My Favorite Things Stamps I picked up this cardstock as it just screamed Tiffany & co. I stamped my image in white and added a little "bling". It wouldn't be Tiffany without the bling now would it? 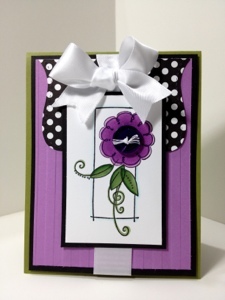 I then added a section of the Stampin Up Top Note Die To finish it off I added that perfect white satin bow! I hope everyone has a wonderful weekend. It's supposed to be beautiful here in sunny Florida! Posted by Karen at 5:54 AM 1 Click here to leave me a comment. Hello everyone. Welcome to all of my new followers that have signed up this week and Thanks to everyone for following along and checking in to see what I have created.
) yesterday you saw a sneak peak of today's card. 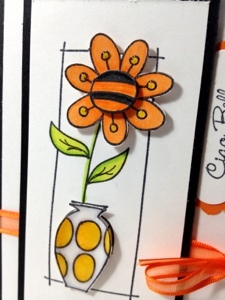 I stamped an extra image and colored and cut out the vase and attached it to the full image. Once my card was complete I covered the vase with the Diva Glass Effects to make it shiny like porcelain. After it dried I put a piece of cardstock over it and placed a punch on it to flatten. The liquid tends to make the paper want to curl but It does create a nice "glass" looking vase. The rest of the card is pretty much simple. I colored the flowers with my Copic markers and cut out the additional flower from the image and attached it using dimensionals. I cannot tell you how many dimensionals I have used in the last couple of months, but I have been through several packs! Love love them! Posted by Karen at 5:47 AM 1 Click here to leave me a comment. Hello everyone. We have made it to hump day!!! It's been a busy week so it's flying by. 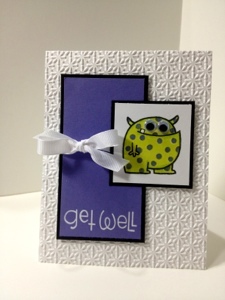 Today I have a get well card that's sure to cheer up any little monster that's under the weather. You can see by his spots he is sick! I colored the Paper Smooches monster using my Copic Markers and gave him some purple bumps. He's just so sad looking. 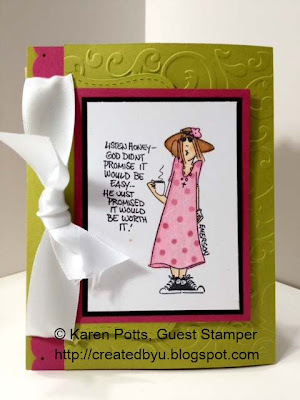 I stamped the sentiment using my Stampin Up white craft ink. I love the crispness of the white on the purple. Hopefully he'll be on the mend in no time! Posted by Karen at 5:35 AM 0 Click here to leave me a comment. Happy Tuesday. One day closer to Friday and more time to create. Cardstock and ran it through the big shot. To me it looks nothing like snow but it's so cute. I then stamped the cupcake and hello. I then colored the cupcake with my Copics. One of the great things about the Copics is the ability to blend the colors and then go back using the colorless blender and removing some of that color. That's what I did here and it perfectly matches the polka dot paper! I then added the spica glitter to the icong and a little bling in the center of flower and finished off with a now. You can now follow Karens Kraftroom on my Facebook page. Please visit and "like" my page. Www.facebook.com\Karenskraftroom. Posted by Karen at 6:12 AM 2 Click here to leave me a comment. Another weekend has flown by which brings us to another Monday! They just get here too fast and I can't believe we are almost half way through March. Today I have a beautiful card to share with you. 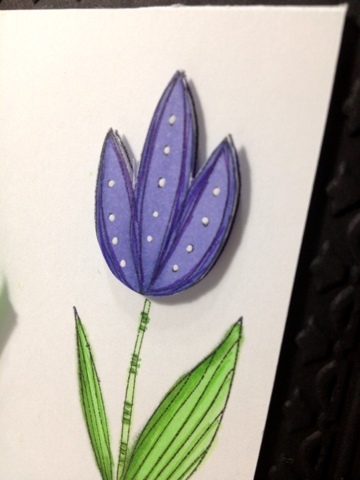 I started with a simple flower stamp and colored it using my Copic markers and added a little spica glitter in purple. I then added the white dots for accent. I then cut a scallop border and adds to the left side. I finished this layer with a coordinating green ribbon. This piece was adhered to my frame embossed card base using dimensionals. I added a close up of the flower so you can see the detail accents. I cannot How I am going through these Stampin Up dimensionals. They are the best. The perfect thickness and there is NO waste. I use the whole sheet! Posted by Karen at 4:52 AM 0 Click here to leave me a comment. Happy Sunday everyone. I hope you remembered to "spring forward". I love this time. More daylight to be outside and warm weather! 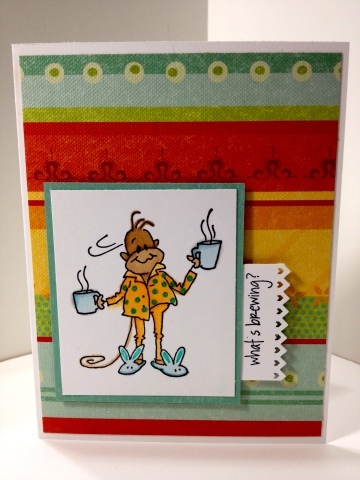 Today's card is made with the Cutest little monkey in his pjs with his first cup of joe! I colored him with my Copic markers and used the blender pen to pull out the color and added the polka dots. The more I use the blender pen and refill the more amazed I am by these markers. The paper is by K & Co.
As always if you have any questions feel free to leave me a comment or shoot me an email. Posted by Karen at 9:25 AM 0 Click here to leave me a comment. 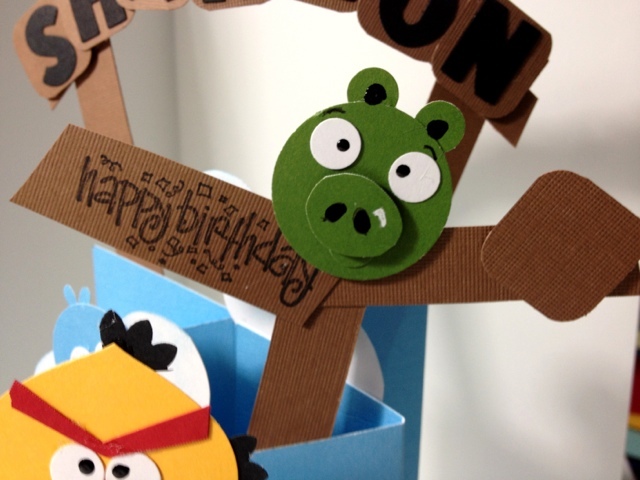 Isn't this the cutest little monster birthday card? And it's PINK!!! Woohoo! I colored her with my Copics and added brightness to the teeth with my white gel pen. The pink border was done with my roller stamp. I love this little saying set. It comes with this one a s another that's a big "u". They make a really cute card. I hope you enjoy your Saturday. I have a couple errands to run and big karaoke party tonight. Posted by Karen at 6:50 AM 0 Click here to leave me a comment. I met Shannon when I went to work at my current job. She was really quiet when I first met her but boy is she a whole different ball of fun now! I invited her over for karaoke one night and little did I know just how talented and crazy she is! That girl can sing! You name it....good bye Earl, One Week (every word), Any Broadway tune all the way down to Disneys little mermaid with theatrics and all! She's a show stopper. Another side of my crazy cat woman friend is her love for zombies and Angry Birds! 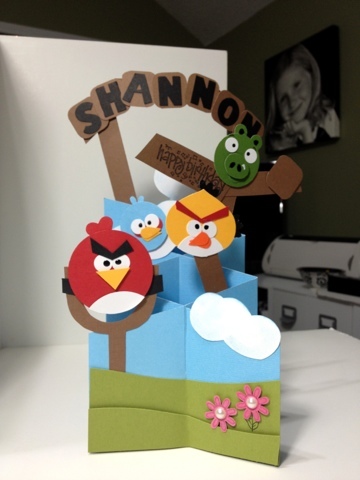 I figured the birds would be much easier to make than zombies so here you go Shannon. Happy Birthday! Luv ya girl! Posted by Karen at 7:12 AM 1 Click here to leave me a comment. TGIF! It's going to be a busy weekend. Full fun ahead!! Today's card is way off the chart for me. I used a color combo so not typical for me but I am lovin it! I stamped the sunflower and colored it with my Copic Markers. I think I'm getting pretty good with them but I wish they would bring on that certification class to a location near me! I used dimensionsls to adhere the sunflower to a draft base. Thir edges of this piece were distressed using my Tonic tool. If you don't have this distressing tool you NEED it! It makes a really nice accent to your projects. 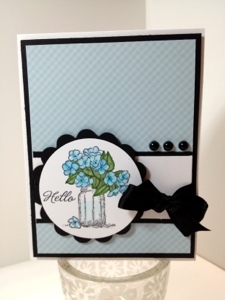 I added my focal piece to gray cardstock and added the aqua bow. I love the final results. Check back later today for a bonus project you won't want to miss!!! Posted by Karen at 4:10 AM 1 Click here to leave me a comment. We're almost to Friday!!! One more day to go and I can't wait. I have a full schedule today so hopefully it will go by quickly! Today's card is just adorable. I colored the acorn with my copic markers. It is probably one of the best results I have seen since I started using them. I have used multiple layers of yummy Stanpin up cardstock along with some patterned paper from My Minds Eye. 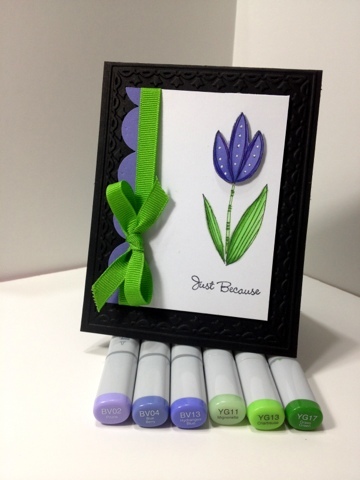 The frame is an embossing folder from Stampin up. Posted by Karen at 5:57 AM 0 Click here to leave me a comment. Have a Beautiful Day...the Cutest little card ever!!! Hello everyone! 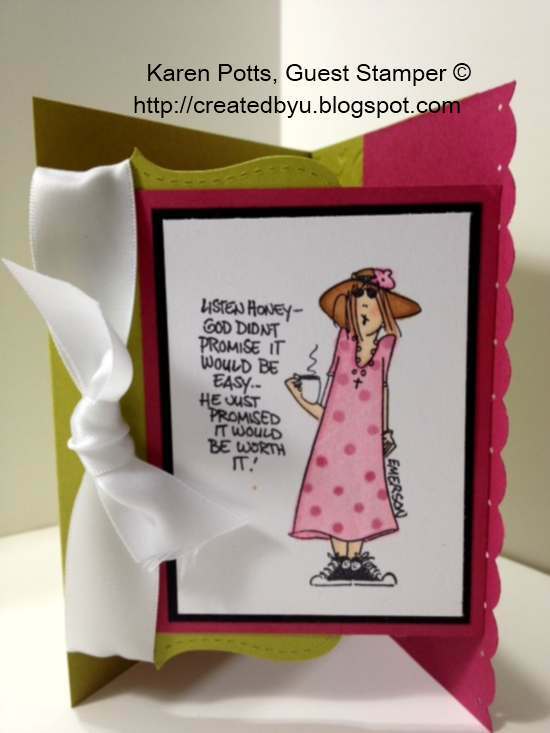 I decided to make a different size card so I chose the little 4x4, it is so cute and makes a perfect gift card. 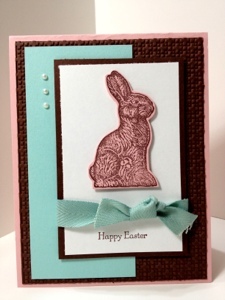 I started with a large Swiss dots embossing folder for the background. I stamped my image with Momento Black Tuxedo ink and colored with my Copics. I then added glitter accents with my Spica pens and then crystal clear diva paint pen on the flower petals. The sentiment is stamped on a tag punch and slipped right under the edge of the mat. For a finishing touch I added the gingham ribbon loop. Isn't it the cutest little card? Posted by Karen at 4:37 AM 0 Click here to leave me a comment. Today I go to school to register my sweet daughter for HIGH SCHOOL! Seems like just a short time ago I watched her get on that bus as a kindergarten and go to big school (I really didn't think she would go but she was so excited to ride the bus). 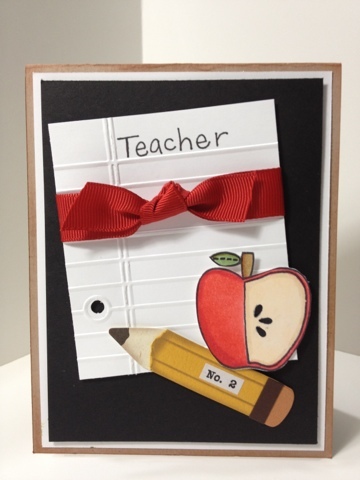 Today's card takes me back to that kindergarten day where we sent notes to school, celebrated teacher week and did all those cute little thank you'd! I used an embossing folder for the paper. 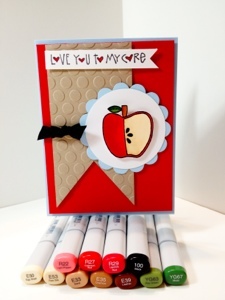 The Paper Smooches apple colored with Copic Makers and the pencil was a premade embellishment from a scrapbooking set. I hand wrote the "teacher". Posted by Karen at 5:52 AM 3 Click here to leave me a comment. Another Monday and it's a chilly one! Hope you had a great weekend. Today's card is a little different for me. 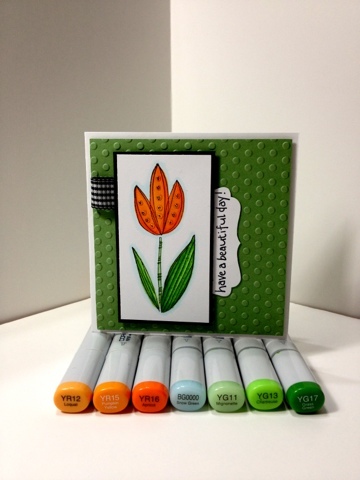 I used a stamp set I received for free at the regrand opening of My Favorite Things stamps weekend before last. I am not a big fan of these little people stamps buy this one was so much fun to color with my Copic markers. I used the colorless blender and a dried baby wipe to create the denim texture on her skirt and vest. I also added the little stitch lines using my copic liner. The sentiment is on a die also from My Favorite Things and the sentiment itself is from Paper Smooches. I lassoed the ribbon around the bottom of the card and tied it off with jute and them threaded it through the button. I found the plaid paper in a My Minds Eye 6x6 paper pad. Don't forget to subscribe to the right so you don't miss any great ideas! Posted by Karen at 6:16 AM 2 Click here to leave me a comment. Wish BIG one last birthday card for the week! Happy Birthday Gift Box. Sweet! !